Anything not mentioned except inclusions. Arrive at New Delhi Railway Station /Airport the bustling capital of India. On arrival pick-up from airport and transfer to hotel for check-in. Day free for own (depending the time permitting). Overnight stay at hotel. After breakfast, drive to Jaipur the fabled Pink city, check-in at hotel, sightseeing of Jaipur covering Jantar- Mantar (observatory), Hawa-Mahal (palace of wind), City palace, Overnight stay at hotel. After breakfast, visit Amer fort & enjoy caparisoned elephant ride on the fort, Book Your treat with your curiosity with JAIBAN (the largest cannon on the wheel) in Jaigarh fort, day at your own. Overnight stay at hotel. 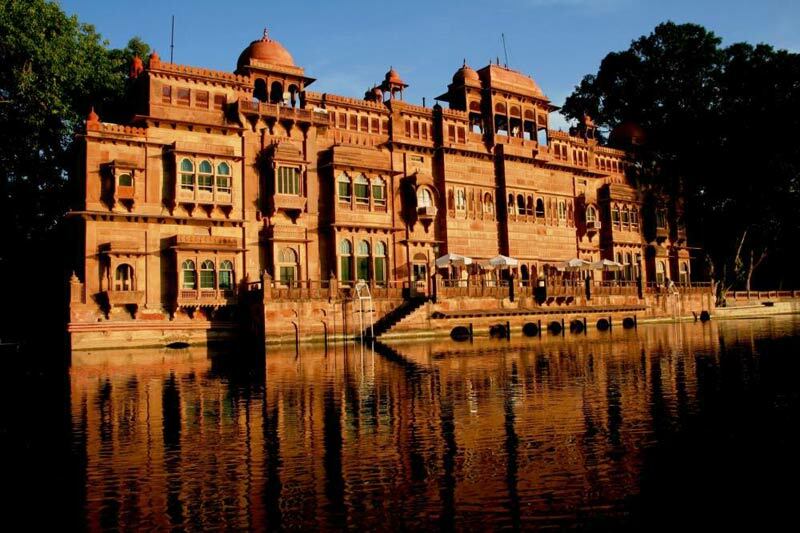 After breakfast, drive to Mandawa, check-in at hotel, City tour of Sekhawati region popularly known as the Open art gallery of Rajasthan; treat your eyes with frescos in havelis. Overnight stay at hotel. Take Breakfast and get ready to visit Bikaner which is also known as the Food Hub of Rajasthan.Visit Junagarh Fort and other monuments. Remember to purchase the world famous Bikaneri Bhujia and late evening back to hotel for rest. After breakfast, drive to Jaisalmer ”the Golden city”, check-in at hotel, visit Sam sand dune, enjoy camel safari and feast your eyes with cultural bonanza in the undulating sea of sand. Overnight at hotel. After breakfast, enjoy city tour of Jaisalmer covering The Golden fort or Sonar Killa, trace the former opulence in the havelis called Patwon ki haveli, Salim singh ki haveli & Nathmal ki haveli. Overnight stay in hotel. After breakfast, drive to Mount Abu , the “Hill Station” of Rajasthan. 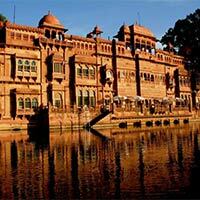 Check in to Hotel and then proceed to visit the famous Nakki Lake and enjoy the boat riding. Dilwara Jain temple and Guru Shikhar should be visited too. Take a walk in the evening in the beautiful market and do some window shopping. Later check in to Hotel for overnight stay. Early morning after breakfast start for Ranthambore and after check in to hotel visit the famous Lord Ganesha temple and amazing fort of Ranthambore, Later evening check in to Hotel back and sleep early as you have to wake up early for morning safari of the mysterious world of Tigers in Ranthambore. Wake up early for the morning safari and after it move to Hotel and get fresh, take breakfast and check out from Hotel to proceed towards Agra. Check in to Hotel in Agra and later on visit the Seventh Wonder of the World “The TajMahal”. Evening free for leisure. Later check in to Hotel for comfortable sleep. After breakfast visit TajMahal (closed on Friday) (Optional-Morning View), Red Fort. Later drive and drop at New Delhi airport for onward journey with a bunch of enthralling & ever mesmerizing moments during your tour.